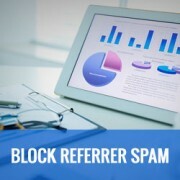 Are you getting a lot of referrer spam in your Google analytics? Referrer spam is a way to pass fake referer information to websites. These spammy links then appear in a users analytics and can lead you to click on malicious websites. In this article, we will show you how to effectively block WordPress referrer spam in Google Analytics. If you are not using Google Analytics on your WordPress site, then you should check out our guide on how to install Google Analytics in WordPress. Google Analytics is an awesome free tool that allows you to see how users interact with your website. You can see which pages users are visiting, track clicks on links, run split tests, and much more. 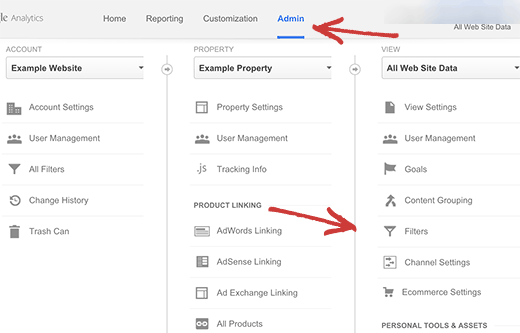 See this beginner’s guide on how to use Google Analytics for your WordPress site. For those of you who are already using Google Analytics, let’s fix the referrer spam problem in your Google Analytics reports. We all want our websites to be noticed. It makes us happy when other websites link to our articles. Referral spammers take advantage of this desire by sending fake referer URL with automated scripts to thousands of websites. This URL then appears in your Google analytics or any other stats service you are using as referrers. Considering the fact that they affect millions of websites, it is likely that many users may want to explore these sites when they see them in their referral reports. Some might say that referrer spam is quite harmless unless you click on the links. Well let’s assume that you won’t click on those links, there are still other downsides. If you are small or medium sized website, then referer spam can ruin your sites analytics reports. If you decide to sell your website and share this report with interested buyers, these spam links can leave a bad impression on them. How We Deal With Referrer Spam? We use Sucuri to monitor our website’s security. Sucuri not only only protects our website against malware and trojans, it also blocks referrer spam. 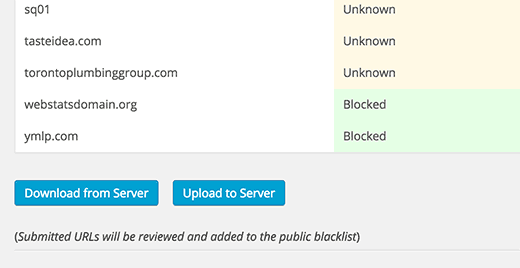 Sucuri Website Firewall blocks most known bad referrals by default. Their team is always adding new referral spammers to the list and actively monitoring their behavior. There are several WordPress plugins that can help you keep referrer spam to a bare minimum. These plugins use web services that are actively monitoring referral spam websites and use that list to block referral spam. First thing you need to do is install and activate the SpamReferrerBlock plugin. Upon activation, you need to visit Settings » Spam Referrer Block to configure the plugin. On the plugin’s settings page, you will see a text area to create your own custom blocking lists. Below that you will see the list of sites this plugin is actively monitoring and blocking. You can update this list with the most up to date version by clicking on the download from server button. If you see a referrer spam link in your Analytics account that is not listed on this page, then you can add it to the custom blacklist. Click on the save button and plugin will start blocking it. 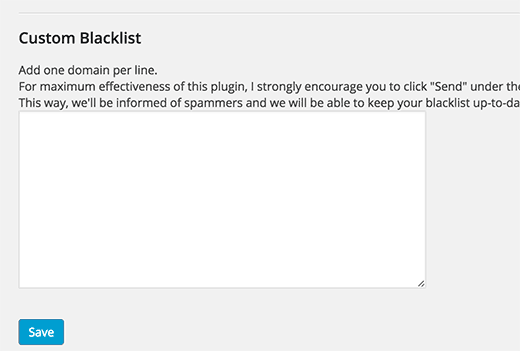 You can also share your custom blacklist with the rest of the internet community by clicking on the upload to server button at the bottom of the page. Despite implementing these solutions, you will still see some referrer spam in your Analytics reports. These websites are not visiting your site at all, so Sucuri or any other tool cannot block them. They are sending their requests directly to Google Analytics using your UA Tracking code. This tracking code is used by Google Analytics to identify your website. Most site owners add it to their WordPress site’s footer or header section. Anyone can look at this code and use the UA tracking id to generate referrer spam. Here is how you can block such websites in Google Analytics itself. 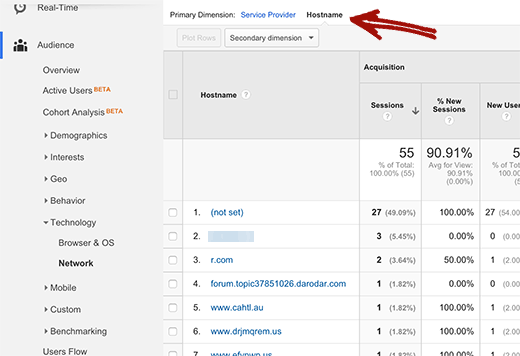 Login to the Google Analytics account and then go to Audience » Technology » Network. You will need to select Hostname as primary dimension and expand the results to Monthly. You will see a list of hostnames with many spam hostnames in the list. You need to only note down the valid hostnames for your website. For example, www.wpbeginner.com, wpbeginner.com, videos.wpbeginner.com, are all valid hostnames for our website. Now that you have your valid hostnames sending, the next step is to create a filter that only includes the valid host names. Click on the Admin view and then click on Filter. This will bring you to the filter screen, where you will click on the New Filter button to get started. You need to select ‘Custom’ as your filter type and then click on Include. You will enter valid hostnames as filter pattern using Regex string. The format is simple, you will add a ^ sign before each hostname and a $ sign after it. Use | sign to separate hostnames. Finally, click on the save button to apply the filter. Give it at least 24 hours before you can notice any changes in Google analytics reporting. Don’t forget to click on the save button to apply the filter. We hope this article helped you learn how to block WordPress referrer spam in Google Analytics. You may also want to see our list of 7 best analytics solutions for WordPress users. If i click on add a new filter, i only get the option to make an “exclude” filter. I don’t see the option to select a “include” filter like in the screen shot at this article. How is that possible? Thank you for providing such helpful information, keep up the good work. I think that this is not good. The best is to reject and block all these spam referrers because they cause to increasing the bounce rate. The problem is not in seeing them in the reports . The problem is how to block visitors from that spam referrers . This is exactly the information I have been looking for! Thank you!!! I agree with Mickey, the easiest way to get rid of those referrer spam is to filter out in Analytics all the requests for which the hostname is not the URL of your blog. Almost all the referrer spam don’t fill up this field, leaving it empty. Maintaining a list is painfull since there are always some new comers in the game. I agree with Mickey, the Referral Exclusion List t seems to be a bad idea. I agree with Mickey. 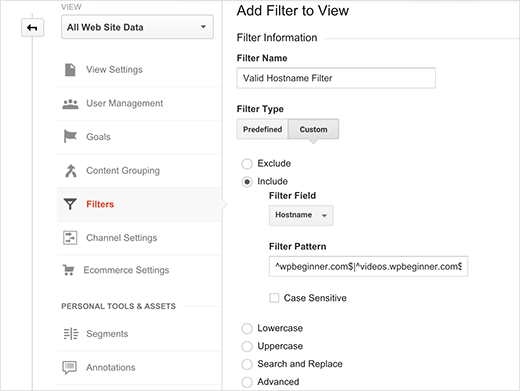 You need to include valide host name in Google Analytics filters and it will block all the rest. Like that you don’t have to worry about future spam to exclude. And you certainly don’t need any plugin. As Mickey mentioned above, using the referral exclusion will hide the problem as visits will be treated as Direct. Please, change the recommendation to using filters instead. Thanks Ruth, we have updated the article with more accurate method of setting up filters. Very nice article on very important issue causing lot of damage to reporting. LOL I have just found out the majority of my “traffic” was spam. Sigh. Thanks for the advice. I have downloaded the plugin & added the spammers to my google analytics. Update: We have updated the article with more accurate method of creating a filter for valid hostnames.Thank you for suggesting it.